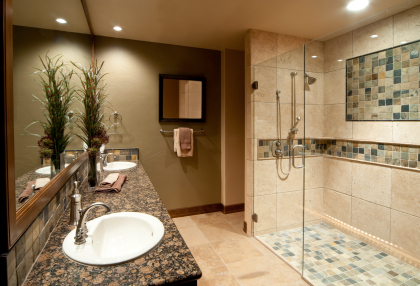 Is your bathroom designed to accommodate your family’s needs for today and tomorrow? Aging-in-place and universal design bathroom design principles incorporate a 60” wheelchair turning radius, wider doorways, roll-under sinks, and many more features that make a home accessible to all. In fact, when these principles are applied correctly to Atlanta bathroom remodeling projects, they make the bathroom accessible for today, and tomorrow, as well! Many metro Atlanta homeowners living in communities such as Lawrenceville, Dunwoody, Buckhead and Marietta are planning to remodel the bathroom in order to gain access for bathing and toileting. They are performing bathroom upgrades that would not have been necessary had the home been designed with aging-in-place and universal design / 55+ design principles originally. These Atlanta bathroom remodeling projects solve the accessibility problems faced by many aging homeowners in our local communities. If you are a person with a disability, have a family member in the home with special needs, or are an individual recovering from an illness, you may require modifications such as a walk in barrier free tub, roll in showers, or other home modifications to make your bathroom accessible. 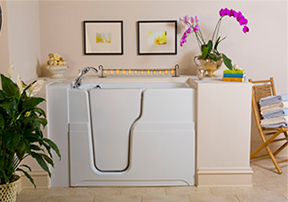 Walk-In Bathtubs: For those who cannot stand for long periods of time (or at all), the walk-in bathtub allows easy access to bathing without having to hoist oneself dangerously into a contemporary tub. Roll-In Showers: These showers not only have easier access but are designed to be used while safely seated. These showers also have the space needed for a caregiver to help out. Grab Bars: Strategically installed around the bathroom can give a fall preventing hand-hold. Additionally can be used to hoist oneself out of a wheelchair. Safety Lights: Bathrooms get steamy which can disorient the elderly. Backlit LED lights help keep a person oriented and safe. Preventative measures to help 50+ seniors and elderly Atlanta residents stay safe include home modifications such as wheelchair ramps for homes, straight and curved stairlifts, and roll-in shower and walk-in bath installations. Would any of these accessibility home modifications or bathroom remodeling projects solve your mobility problems and enable you to move freely within your home? Get more info from the certified aging in place professionals at Atlanta Home Modifications at 770-880-3405 to learn more about bathroom fall prevention for 50+ seniors and elderly Atlanta residents. Bathroom remodeling is challenging for many metro Atlanta homeowners living in diverse north Georgia communities such as Lawrenceville, Dunwoody, Buckhead and Marietta—but, for a person with a disability, it can be overwhelming. We would like to help! This entry was posted in Aging-In-Place Design, Atlanta Roll-In Showers, Atlanta Walk-In Tubs and tagged aging-in-place and universal design accessibility principles, Atlanta bathroom remodeling, Atlanta Lawrenceville Dunwoody Buckhead or Marietta Homes, walk-in tubs and wheelchair roll-in showers by atlantahomemods. Bookmark the permalink.